Brief Synopsis: Despite their best efforts, the Justice League's battle with the Gray Man goes poorly. 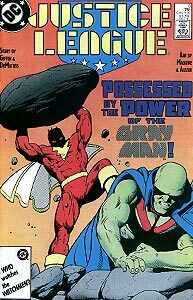 Issue Summary: When the Gray Man realizes that the Justice League has joined forces with Doctor Fate and the Creeper to free the citizens of Stone Ridge, Vermont, from his mad scheme for destroying all humanity, he unleashes his mind-controlled Captain Marvel against the team. Marvel is more than a match for the rest of the League, but not Martian Manhunter. The fight with the Manhunter proves too stressful for the Gray Man, and he is forced to release his control of Marvel. Elsewhere, Maxwell Lord and Hal Jordan debate the merits of having Guy Gardner as a member of the new Justice League. Jordan is very much against it, but fails to persuade Lord. In Stone Ridge, Doctor Fate is also free and is pressing his advantage against a staggered Gray Man. In defense, the Gray Man summons the citizens of Stone Ridge to battle the League in his stead. One by one, Booster Gold, Creeper, Mister Miracle, Blue Beetle, Black Canary, and Batman fall before the mystical onslaught. Booster finds that making tactical suggestions to Batman, the Justice League's resident strategist, is not always the best idea when Batman takes Booster's advice the wrong way. 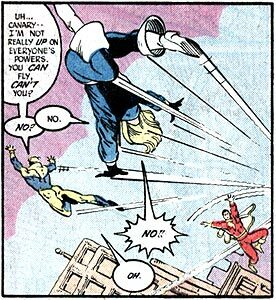 Booster learns that waiting until the last moment is probably not the best time to investigate his teammates powers when a possessed Captain Marvel throws both Booster and Canary into the sky. The Gray Man has taken headquarters inside Stone Ridge's vintage 1940's Rialto Theater. The marquee for the Rialto advertises "Timothy Dalton in 'The Living Daylights'." The movie was released in July 1987, approximately the same time as the publication of this issue. Booster and Beetle agree that they are not interested in involving themselves in battles of a mystic nature. Clearly, neither science-based hero feels comfortable with subject of magic. Booster's fears about a mystical battle prove accurate when his trusty, "impenetrable" force field is effortlessly penetrated by the Gray Man's minions. This incapacitates Booster for the remainder of the fight. Boosterrific Review: New to the team, Booster Gold is quickly taught the lesson of why there needs to be a Justice League. This story of the League versus a cosmic-level threat is exactly the sort that showcases the strengths of the League concept. Though Booster is relegated to little more than the role of tagalong, Keith Giffen's plot is gently easing Booster into his own role with the team in a manner that is both organic and satisfying. I enjoyed this issue-again like Justice League 5, a great issue if not a great Booster issue.